ASCC/CNR staff working under the Children's Healthy Living (CHL) Program take their message directly to the students at Alofau Elementary School (Photo Courtesy CNR). 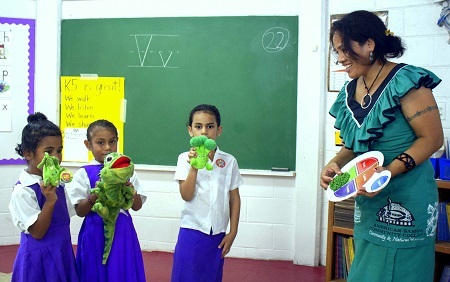 Talimatagi Va'alele-Isaako of ASCC/CNR engages students at Alofau Elementary School using puppets. The activity is part of the Children's Healthy Living (CHL) Program's goal of raising awareness of healthy nutrition and physical activity (Photo Courtesy CNR). The Children’s Healthy Living Program for Remote Underserved Minority Populations in the Pacific Region (CHL) is a partnership among remote US states and territories including Alaska, American Samoa, Common wealth of the Northern Mariana Islands, Guam, Federated States of Micronesia, Hawaii, Republic of Palau, and the Republic of the Marshall Islands. These jurisdictions, which have US Land Grant Colleges, are united in the Pacific Land Grant Alliance, and are combining efforts to train a public health nutrition work force; to conduct public health nutrition research; to develop a food, nutrition, and physical activity data management and evaluation system; and to communicate nutrition and health related information to the public. The American Samoa arm of CHL is the Community & Natural Resources (CNR) division of the American Samoa Community College, where efforts have been underway for the past two years to engage the community in awareness of childhood obesity and steps that can be taken to mitigate it. The first phase of activity involved taking measurements among groups of children in selected villages, which would serve as a data baseline for research to follow. CNR staff participating in the CHL program have now moved on to the intervention stage of the project, and have made multiple visits to schools (Head Start, Kindergarten and grades 1 – 3) in the intervention villages. 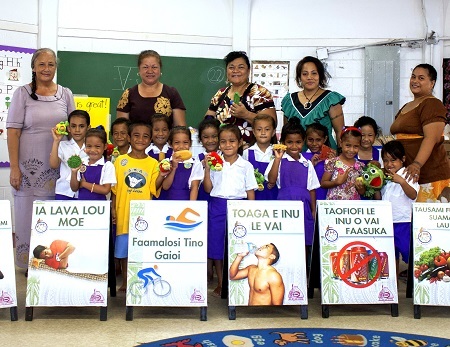 There, CHL nutritional staff conducted workshops and physical activities using the LANA (Learning About Nutrition through Activities) preschool program utilizing learning materials adapted linguistically and culturally to a Samoan context. So far there have been ten school visits in five different intervention sites involving participation of 305 children. Another major achievement was bringing together 16 ministers of various denominations from churches within the intervention villages to the CNR Wellness Center to develop intervention strategies through the churches. CHL lead site Co-Principal Investigator Aufa’i Apulu Ropeti Areta presented a PowerPoint on the CHL program objectives and strategies, and generated group discussion on the role the ministers can play in facilitating healthy behavioral changes in their congregations. During these engaging discussions, many ministers expressed strong intentions to integrate health messages into future sermons. Other intervention activities are also being developed. Lead site Co-Principal Investigator Areta, along with CNR Manager of Agricultural Extension Tuna’i Alfred Peters and CNR Horticulturalist Ian Gurr, have begun scouting the intervention villages and schools, discussing sites for establishing vegetable gardens and hydroponics. Dr. Don Vargo gave a brief presentation on the CHL program to nine members of the America Samoa’s “Obesity Study Committee”. Intervention Specialist, Agnes Vargo has been communicating with key community partners in developing other types of intervention activities. Progress has been made on designing and producing social marketing and media to stimulate and reinforce the six CHL behavioral changes. The issue of obesity is gaining increased attention throughout American Samoa. The Governor recently appointed an Obesity Task Force to guide policies and strategies to reduce obesity, of which CNR Director/Dean Tapa’au Dr. Dan Aga is a member. Obesity is an environmental, social, cultural, political, and economic issue that must be addressed at all fronts. For example, food carries much cultural weight in Samoa, symbolizing love, relationship and hierarchy, particularly when it is publically presented, consumed and exchanged in the frequent Samoan ceremonial events. The amount of food, particularly meat complemented by starch foods, has social and political significance. The CHL team intends to formulate strategies to encourage healthy perspectives on the role food plays within local culture. Tapa’au Dr. Aga serves as Chairperson for the CHL Program in American Samoa, with Aufa’i Apulu Ropeti Areta serving as Lead Site Co-Principal Investigator and Urusla Te’o-Martin as Co-Principal Investigator. The CHL Program is a Food and Agricultural Science Enhancement (FASE) Coordinated Agricultural Program (CAP) among Pacific Region USDA-defined Experimental Program for Stimulating Competitive Research (EPSCoR) states/jurisdictions.